The 2017 NBA Draft has come and gone. One team that walked away better than most, were the Charlotte Hornets. we saw the ever improving Kemba Walker take his game to a new level, and earn his first NBA All-Star appearance. The Hornets however, recorded a 36-46 record, and failed to berth playoffs. Awarded for their failures with a lottery pick in the draft, nobody foresaw the talent that would fall to Charlotte. 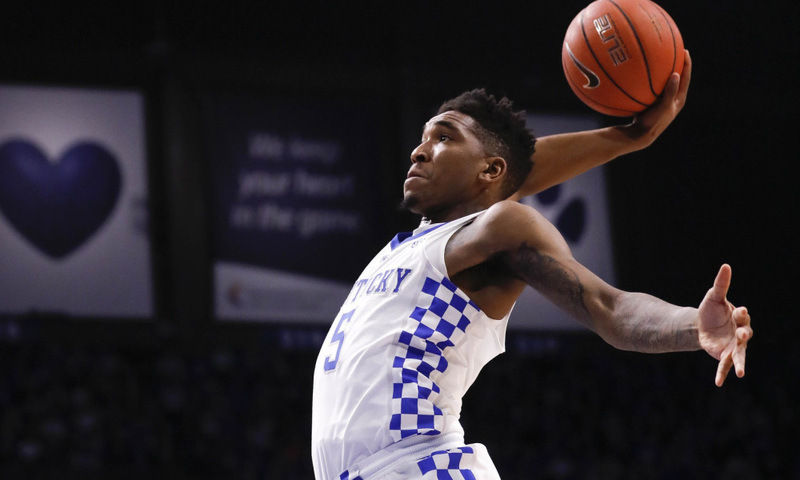 Malik Monk, freshman shooting guard out of Kentucky University. Someone the Hornets were not expecting. Originally projected to fall to New York with the eighth pick, Monk slipped when New York drafted French guard Frank Ntilikina. And the Hornets are glad he did. For the Hornets, this Kentucky Wildcat will serve as starting shooting guard next to point guard Kemba Walker. One of few players ready to compete on the NBA level, his play should transition smoothly. For Monk, being drafted to Charlotte almost seems meant to be. Yes, it’s not the Boston Celtics, a team who are preparing a run back to the Eastern Conference Finals. However, the Hornets are a young and developing team, who competed in the playoffs as early as last season. Placing Monk into a core of Kemba Walker, Nicolas Batum, Michael Kidd-Gilchrist, and newly acquired Dwight Howard will make for a very fun team to watch. In a sensational freshman season at Kentucky, Monk averaged 19.8 points while shooting 45 percent from the field and 40 from behind the arc. Frank Jackson. Well not really. The Hornets traded the Duke guard to the New Orleans Pelicans for cash considerations and the 40th overall pick. Dwayne Bacon, sophomore small forward out of Florida State University. Though he declared for the draft in 2016, he felt the need to progress his game one more year to become NBA ready. Bacon improved nearly every aspect of his game, and lead the Seminoles to the second round of the NCAA tournament; alongside 6th overall pick Jonathan Isaac. For the price they paid, the Hornets felt great about his projected contribution. In his sophomore season at FSU, Bacon averaged 16.5 points, and 5 rebounds per game on 45 percent shooting from the field. With this pick, the Hornets have earned a great player who can get to the line, and whose offensive ceiling has no bounds. The Charlotte Hornets come out as winners in this draft. Malik Monk may prove the most versatile scorer in the entire class, and Bacon has potential to be a valuable role player down the road. In a two-day span, Charlotte traded for an All-Star center, and drafted two NBA ready talents at 11th, and 40th overall. I would expect nothing less from a franchise ran by the greatest of all time, Michael Jordan himself. Malik Monk’s sharpshooting, paired with the explosiveness of Kemba Walker? Charlotte’s coming for you Eastern Conference, sooner than later. All stats and information provided by ESPN and NBA.com. Featured image provided by The Fresno Bee via Google Images.